This taster pack is a great way to enjoy a selection of Palace Culture's delicious artisan vegan cheeses. Palace Culture carefully craft all of their fermented vegan cheeses by hand and use no artificial additives or preservatives. Select your flavours using the option on the right hand side. The cream cheeses come in jars and are perfect as a spread, with a rich, natural flavour and a nice creamy texture. The semi-soft cheeses are goaty style cashew cheeses, made with lush creamy organic coconut milk. 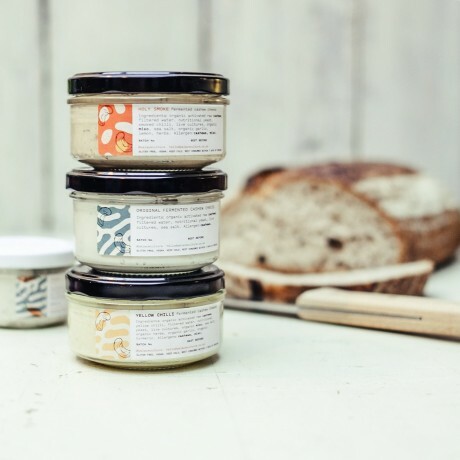 Palace Culture's artisan cheeses are made using the traditional process of fermentation, which creates beneficial enzymes and strains of gut-friendly live cultures, b-vitamins and minerals. Cream cheeses shelf life: 4 weeks in the refrigerator, 2 months in the freezer. Orders received by 1pm Friday will be dispatched the following Monday with next day delivery to arrive on Tuesday. Orders received by 1pm Monday will be dispatched the following Thursday with next day delivery to arrive on Friday. Almond Ricotta Vegan Cream Cheese: Organic raw and activated almond nuts, live cultures, cornish sea salt. Garnish: organic extra virgin olive oil and organic herbs. Holy Smoke Vegan Cashew Cream Cheese: Organic activated raw cashews, filtered water, live cultures, organic miso (soy), Cornish sea salt, smoked chilli, organic garlic, herbs, black pepper, organic olive oil. Yellow Chilli Vegan Cashew Cream Cheese: Organic raw and activated cashew nuts, live cultures, organic fresh miso (soy), cornish sea salt, yellow chillis from Peru, organic black pepper, organic garlic, organic herbs. Truffle Black Pepper Vegan Cashew Cream Cheese: Organic raw and activated cashew nuts, live cultures, organic fresh miso (soy), Cornish sea salt, truffle oil, organic black pepper. Paprika Vegan Semi-soft Cashew Cheese: Organic activated raw cashews, filtered water, live cultures, Cornish sea salt, full fat organic coconut milk, paprika, toasted garlic, chilli flakes. Truffle & Activated Black Ash Vegan Semi-soft Cashew Cheese: Organic activated raw cashews, filtered water, live cultures, Cornish sea salt, full fat organic coconut milk, activated black ash, truffle oil, black pepper. Palace Culture Almond Ricotta is out of this world DELICIOUS! This product is dispatched by Palace Culture. This item has a shipping weight of between 280g and 280g depending on the options selected.